Bryan Cranston creates Phillip Lacasse a billionaire who became a quadriplegic during an accident while indulging in the sport he loved – hang gliding. The actor faces the challenge of acting the whole movie from a wheelchair where he must create all his moods and conversations with just his voice, facial muscles and his eyes. Nothing else moves. Over the course of the story, he creates a man of intelligence, acceptance, kindness and humor. Doing that without moving a muscle is quite an achievement. Unable to do even one thing for himself, Phillip needs a man who will take full emotional and physical care of him for the rest of his life. As he interviews a long line of applicants for that job, he is drawn – for reasons we will learn later – to the thoroughly inexperienced Dell Scott (Kevin Hart). 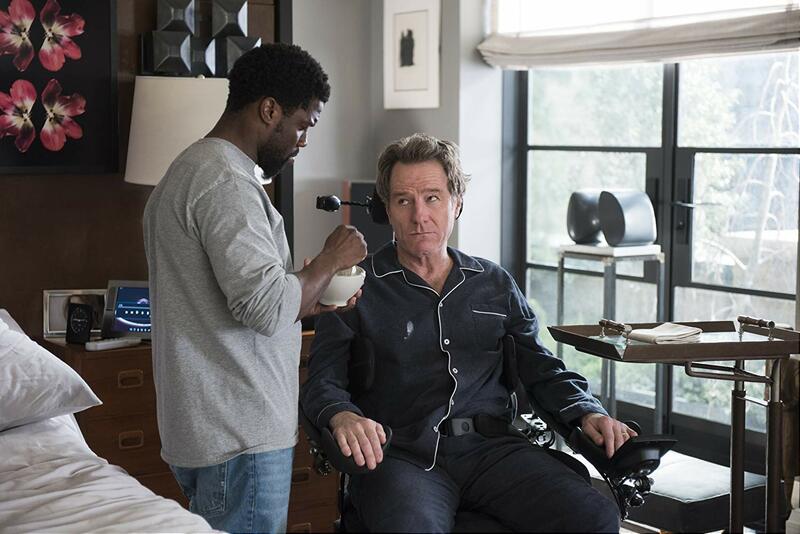 Against all advice, Phillip chooses Dell who appears to be the worst possible choice as caregiver to a quadriplegic. But as each shares things he knows the other needs, trust and friendship grow in the two men and in the audience. The first half hour plus the premise are not promising. After that, settle in and enjoy watching some good actors make that improbable premise work in a way you don’t expect. How? There’s not a flawed performance. Nicole Kidman’s Yvonne, who runs Phillip’s business for him, is loyal and never overdone. Kidman has an instinctive sense of what might be too much or too little and she creates a fine character who we watch carefully for subtlety. Julianna Margulies appears for a short, sharp few moments in a role that’s tough to play given the situation. If you are trying to decide whether to see a movie about a quadriplegic and his caretaker, it would be easy to imagine a downer of an evening. Don’t do that. Because of the performances there is a lot of laughter here, all delivered for our pleasure in a way that is thoroughly natural rather than contrived. Both Kevin Hart and Bryan Cranston do something that is unusual and extremely moving: each finds a way to contribute something major to the other’s life. There have been several movies this year that are rooted in tough truth that bring a fine gift to the audience. This is one of them. On this particular team of director Neil Burger and his cast, every one of them creates an interesting individual. Once again, because of strong, quiet talent, a sleeper of a movie surprises and moves its audiences. And yes, you are likely to tell people you’ve just seen a quadriplegic and a down and out street walker create great pleasure for audiences. This review was posted on February 10, 2019, in Comedy, Drama. Bookmark the permalink.